One night this summer, I some how found myself in the world of Willard the Wizard. I had come across a VHS tape titled 100 Years of Willard. In regards to quality, it's awful, but if you're talking about content it was very interesting. I think the video dates back to 1995, and I'm not even sure where I picked it up at. Probably one of my late night eBay purchases. The first thing I discovered is that there were a LOT of Willard the Wizards. There was James, the original, who was born and traveled throughout Ireland with his tent show. Then there was James the second, the son of the original who moved to the US and became the first U.S. Willard the Wizard. Then there were his three sons, Harry, Tommy and Bobby, all of whom would eventually become Willard the Wizards. 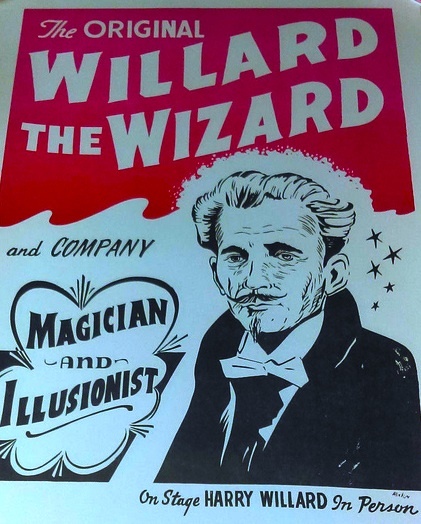 Bobby the eldest son, who was born in the 1880s went back to Europe to tour as Willard the Wizard there. He then took the tour to Australia and died in 1913. Harry Willard was born in 1895 and the youngest brother, Tommy was born in 1903. Both Harry and Tommy would take out shows of their own, replacing their papa James, who became the business manager. In 1936, Papa Willard passed away, and then a few weeks later Tommy passed away. All the props and equipment from Tommy's show went to Harry. Harry Willard would go on to to be the best known of the Willard the Wizards. But surprisingly, among the family, they all felt that there was no better Willard the Wizard than Papa James. Unfortunately, we know little about his performances. From an article on Willard in the Nov 1950 of The Sphinx, I learned something very surprising. When you attended a Willard The Wizard show, you were not bombarded with pitch items. There were no programs, no t-shirts, no toys, no magic sets, nothing to buy beyond the ticket. (I'm not sure about concessions, like popcorn and soda, however). This was a long standing tradition with the Willard's going back to the very original Willard. The feeling was they were performing artists and it was their responsibility to give the best theatrical performance they could. The price of the ticket was enough for them. How different it is today. When attending any sort of show, whether it's a sporting event, concert, circus,play, musical, or magic show, there is a great deal to buy afterwards. Why? Well, people like souvenirs, many folks collect these things. Memorabilia is big business. Plus, it helps to cover many costs associated with putting on a live show. In other words, it's good business. But the feeling from the Willard Show 70 years ago was that you were a huckster to sell such things. It just goes to show how it is a bad idea to judge history by modern sensibilities. Several sources mention that Harry Willard performed in the style and manner of Alexander Herrmann. Again, I'm assuming that connection is made by folks who were familiar with both entertainers. We know that Herrmann was an especially charismatic performer and was known to be quite funny as well. So I would assume that Willard possessed those qualities as well. An interesting point that was made in an article by Walter Blaney is how humble and unassuming Harry Willard was offstage. In fact, you'd never know he was Willard the Wizard when he was offstage. But when it was showtime he would totally command the stage! 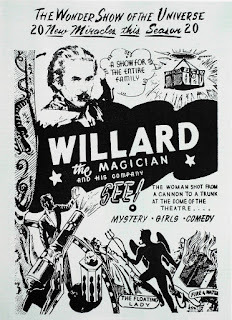 One thing that set Willard apart from other magicians of the time, and possibly the reason he is not better known, was because the Willard show was a tent show. They traveled with a huge circus style tent from town to town. Unlike Thurston, Dante, and Blackstone who were theater performers, Willard was on his own stage every appearance. The show was also a regional show, traveling to mainly areas in Texas in Louisiana. But folks from those areas who saw Harry Willard, all had the same opinion of how great the show was. 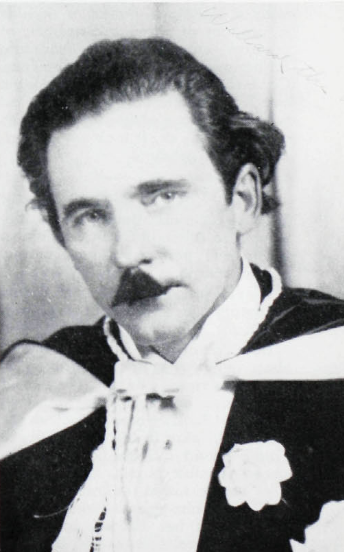 No less than Walter Blaney said, "He was the BEST magician in the world!". 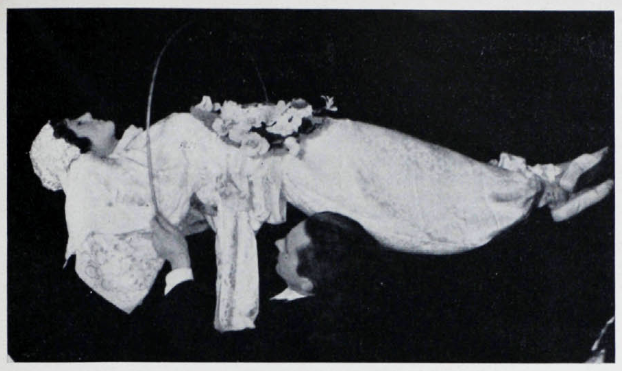 Among his performing material he presented, the Metamorphosis, the Dolls House, Selbit's Stretching a Lady, Girl Without a Middle, multiple different levitations, Glass lined trunk, Cremation, the Spirit Cabinet, the Costume Trunk and on and on it went. They traveled with three different shows because over the course of the time they were in a town, they would present all three programs. Just amazing to consider. Of his performing material, there are some pieces that really stand out. One of those was his Thumb Tie. No one has ever done a better, more convincing thumb tie than Harry Willard. Virgil is quoted in the Willard the Wizard book by Bev Bergeron, "My personal thought on the thumb tie is that there never has been one as good before Willard and I doubt if there ever again will be one as good." Another classic from the Willard show is The Spirit Cabinet. The version Harry presented was the Anna Eva Fay Spirit Cabinet. He performed it with his wife and later in life he taught his daughter Frances to perform the part of the medium in the routine. Frances Willard later went off to perform the Willard Spirit Cabinet with her husband Glenn Falkenstein for years after. From what I have heard, there is a new generation trained to do The Willard Spirit Cabinet, Frances's daughter Hannah and her husband, Michael Ammar. One illusion really stands out, The Cannon and Nest of Boxes. I have seen such performed by Blackstone Jr., Mark Wilson, and others. Usually. the illusion involves a rather large and frankly fake looking cannon that the girl climbs into and is apparently shot INTO the boxes. But Willard used a real cannon. The assistant was strapped to the mouth of the cannon, and when it went off, a huge puff of smoke and a very large BANG! In that moment she vanished! No coverings, she simply vanished. Oh man I wish I had seen this as it sounds spectacular! And of course she was discovered moments later inside a nest of boxes. I should point out, because other writers have also pointed it out, that the nest of boxes were awfully small, which made the illusion even more sensational and bewildering. Harry Willard died at the age of 74 in San Antonio Texas. He had just received a Performing Fellowship from the Academy of Magical Arts in February of 1970, a few months before he passed. I have purposely left off the bigger details of the lives of the Willards as I didn't think I could do it justice from the little information I have used as source material. There is a book by David Charvet, published by MC Magic Words called, Willard: A Life Under Canvas, that will surely do a far better job of detailing the life of Harry Willard and his family than I can do here. I actually, don't have a copy of the book, which now is top on my list of books to get! And if you'd like to learn more about Willard the Wizard, I would encourage you to try and find Bev Bergeron's book Willard the Wizard or David Charvet's book Willard: A Life Under Canvas. When I was a child and would show my grandmother a new trick I learned, if she liked it, she would say, "You're getting pretty good, let me tell you, you should have seen Willard the Wizard, now he was something!" She probably saw him in either Paoli or Chickasha Oklahoma. She noted during the depression when many had NO money, they could buy their tickets with the eggs, vegetables, etc. from their farms instead. That's amazing. Thanks for sharing Diego! My great grandmother was an on stage assistant for "Harry Willard’s Stage show" in the late 30s. She joined the show out of Tallulah LA. Until she was married in 1937. She would tell us tales of being "the girl who was sawn in half.